Guest post by Clare, travel blogger at Altitude Treks – for everything high-altitude. 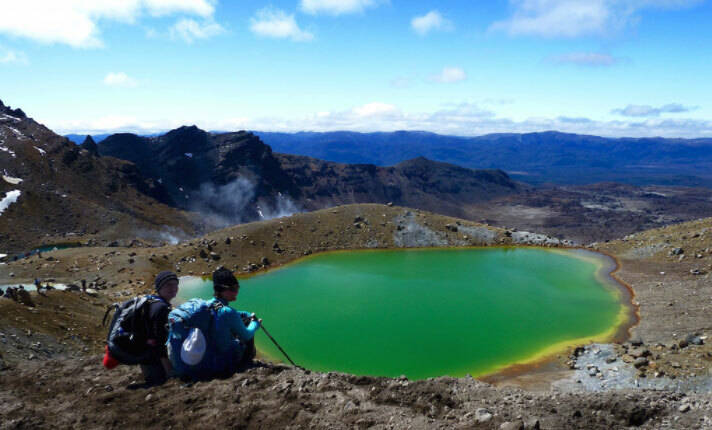 The Tongariro Alpine Crossing is touted in guide books and magazines as “the best one day hike in New Zealand, if not the world”. I thought this would be the perfect way to dust off the winter cobwebs and get into the great outdoors. 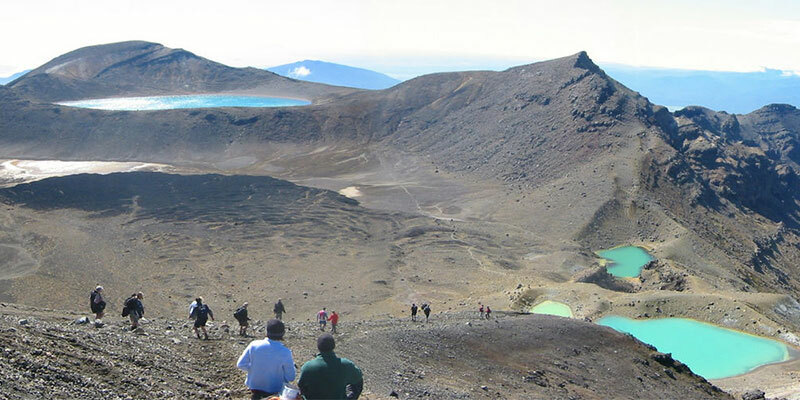 Tongariro National park lies in the central North Island, just south of Lake Taupo. The whole area is actively volcanic, with bubbling mud-pools, steam-vents and hot springs. 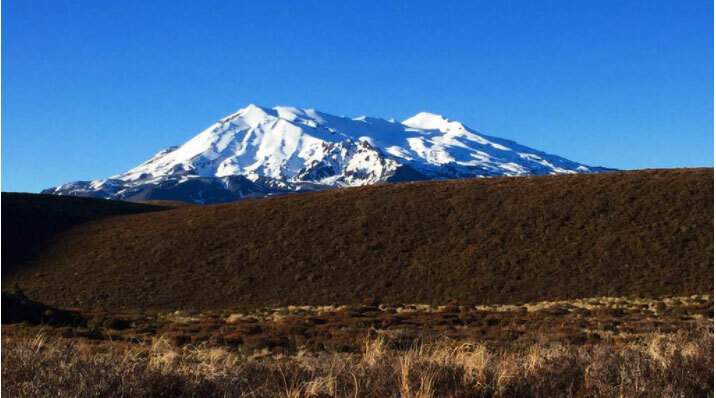 The highest peaks on the North Island of Mt Ruapehu, Mt Ngauruhoe and Mt Tongariro tower above the plains below. 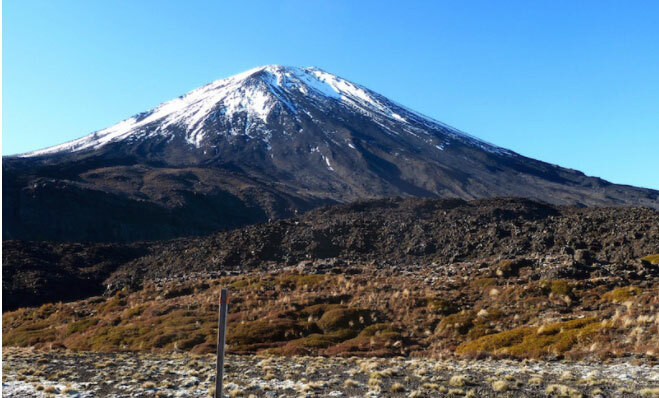 For Lord of the Rings fans, some of the filming was done in this area, and Mt Ngauruhoe was the inspiration for Mt. Doom! We were lucky to have picked the only clear day for weeks. It’s an early start, as with any alpine region, the weather can change dramatically in an instant. After some dire warnings about people getting injured and having to be rescued, I made sure I was prepared. I should note a slight cultural difference here: New Zealanders love doing things that most people would consider “highly dangerous” and “threatening to life and limb”. So when a New Zealander warns that in bad weather, the crossing can be treacherous, it’s worth listening. But the weather was perfect! The trail starts with a nice easy walk through the low alpine heather-and-moorland zone, looking up at Mt Ruapehu and it’s snowy peaks. The trail, well-worn and signposted, some parts a gentle incline. It’s magical here. The brushy plants waking up after their winter hibernation, birds singing and soaring overhead. The bright blue sky contrasting with the snow on the mountains as the sun rises. Eventually, the track gets a bit more rocky, the lava flow becomes more obvious. The heather gives way to more hardy, high-alpine plants. It suddenly seems more bleak, more barren. 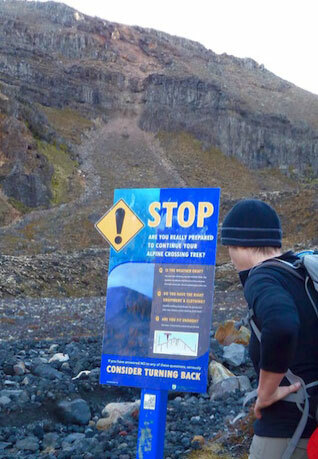 And then the real fun starts… An ominous sign warning us to “turn back” if we are not prepared, not fit enough. But we proceed. After all, this is a training hike for Mt Kilimanjaro, right? The first difficult section is the Devil’s Staircase. Again I would note that if a New Zealander calls something a “devil’s staircase”, it’s because it is pretty tough. The track is steep, rough, and rocky. I admire the view on many occasions, mainly so that I can catch my breath! But those views are stunning. Over the plains all the way to Mt Taranaki in the south, miles of untouched New Zealand beauty fill the vistas. Photographs cannot really convey the scale. After about an hour, we reach the top of the ridge, where the trail flattens out – the South Crater. And now it’s really barren. 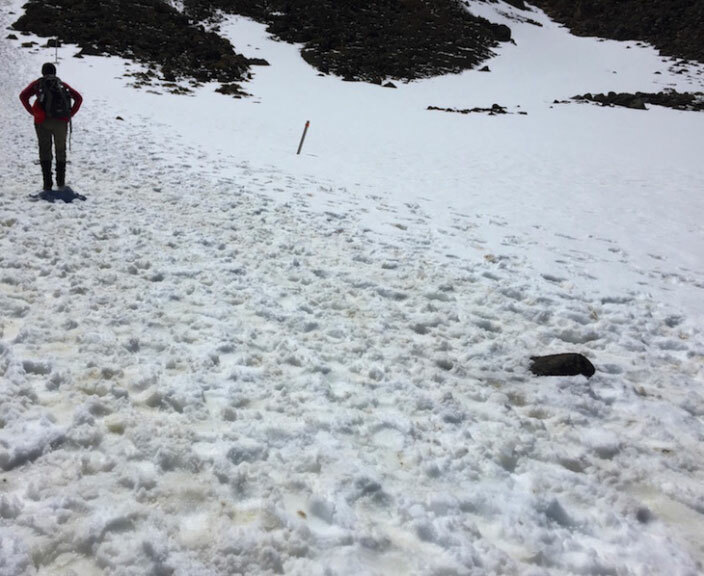 The remnants of the winter snows mix with the volcanic scree to make it slushy and slippery underfoot. There is very little plant life here, just the barren rock and the ominous Mt Doom to the left, and Mt Tongariro to the right. It’s obvious that we are heading towards a ridge. I’m well aware that in order to reach the spectacular Red Crater, we are going to need to climb out of the South Crater – and it looks steep. Steep it certainly is. Being a somewhat “shoulder-season” between winter and summer, there is still ice on the ground, the rocks loom overhead. I take to the – now steep – trail with my trusty walking pole to keep me balanced. It’s slippery, it’s hard. A few sections are very exposed, but helpfully the Department of Conservation has installed chains to the rocks. We had to haul ourselves up in a few places – as there was little foothold. At last we reach what seems to be “the top”. I can see the Red Crater a little way in the distance. But.. oh dear, what’s this? It’s Exposed. Very exposed. A scree slope littered with large rocks, with a steep drop on either side. I hate heights. There I’ve said it. And here I am, preparing to hike along a narrow ridge, one side dropping down into a stinky volcano, and the other… well that side seems to go on forever. It’s now I’m grateful that we have good weather. In bad weather this part of the hike – in particular – would be extremely dangerous. We push on. We can smell the Red Crater before we actually see it. The steam vents and fumaroles pushing out sulphurous gases are a timely reminder of those words “active volcanic area”. The red colouring on the side of the crater is due to iron deposits. The pictures don’t show quite how red it really is. Think a dark ochre color, contrasting against the black volcanic rock. From this position we can see a 360 degree view of the whole region – the views are breathtaking. Lake Taupo in the distance, the blue lake in the foreground, the forests.. It goes on. And onto the Emerald Lakes. Different leached minerals create the colour of these little lakes. But we’ve got to get down there first. I hadn’t thought about that part. Since the red crater sits atop an almost perfect volcanic cone, the way down is as steep as the way up. Let’s just say I spent some time on my backside during this part of the trail! It’s steep, the scree is slippery. And my knees were complaining. After admiring the Emerald lakes, and having some lunch on the shores, we started off again, across a flat plateau towards the Blue Lake. 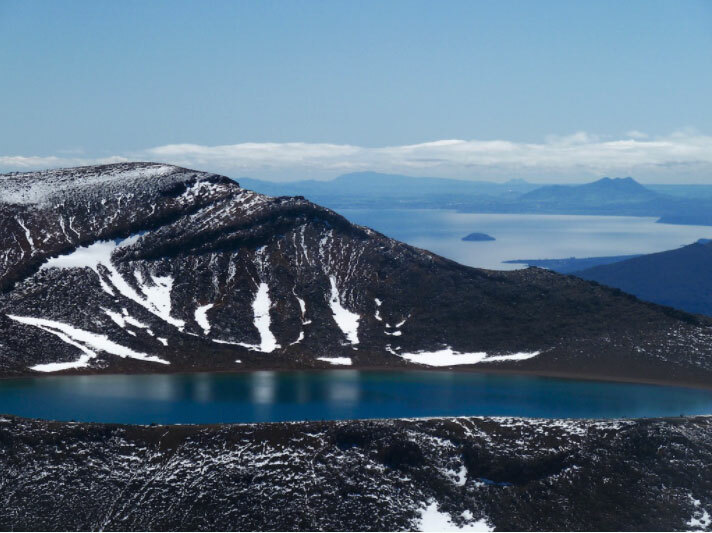 This cold, acidic lake is sacred in Maori tradition. With the “worst” of the uphill over with, it was a pleasant walk across another barren plain to the snowy shores. A bright blue lake with white snow beaches. I reflected on the diversity of the environment we have passed through, the way that nature forms vibrant colours and vistas. A far cry from a normal “walk in the bush”. New Zealand’s environmental diversity is amazing. The rest of the hike consists of a long, relentless downhill struggle. Word to the wise: make sure your hiking boots are well worn-in, and tighten those laces! I found the downhill section at the end very tough on my knees and it seemed to go on forever. But New Zealand always has a surprise. Just when we thought we couldn’t possibly go any further, the thick bushy heather gives way to a vibrant forest. A big stream runs through this forest, and there is another ominous sign “Active Volcanic Zone. If you hear noise from upstream, DO NOT ENTER. Proceed quickly through this area, without stopping”. Really? Yes, really. In 2012 there was an eruption here. There’s nothing like a warning like that to put a spring in your step and a sense of excitement in your blood. It was fascinating to think that we were actually walking through a forest that could explode at any time. Well, it’s very carefully monitored, so the chances are pretty slim – but still! Arriving at the carpark where our bus was to meet us, we felt exhausted but with a sense of exhilaration that we’d done it! Our eyes had feasted on the best of New Zealand’s views, our bodies had certainly earned their dinner. We returned to our hotel tired, with memories of an amazing day out. Would I do it again? Heck yes! 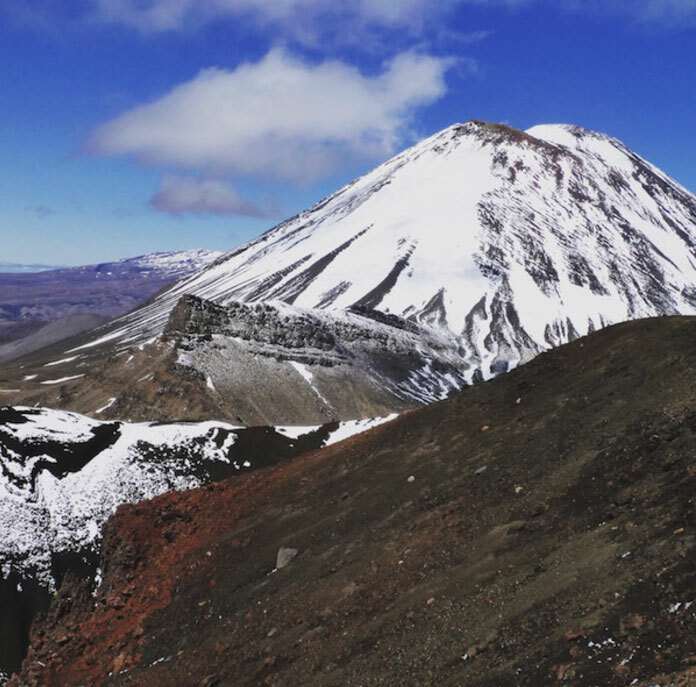 And if you find yourself in New Zealand, I can highly recommend the Tongariro Alpine Crossing. Never attempt this in bad weather. Always check the weather report beforehand, and be prepared to turn back if the weather closes in. Wear sturdy hiking boots. Leave the sneakers at home. The trails are rocky and uneven and you don’t want a turned-over ankle. Take plenty of food and water. In hot weather, this hike can be exhausting and staying hydrated is very important. Pack those foods you normally avoid at home – you’ll need the calories! Layers. Take lots of layers. The temperature can start out warm (think tee-shirt) but once you’re up nearer the red crater, with the icy winds off the mountains, you’ll be pleased you took a couple of fleeces. Rain gear. Oh yes, there is a lot of rain in New Zealand. Even on a perfectly clear day, the rain can come in quickly. And once the temperature drops and you are soaked – it’ll be freezing. Respect this fragile environmental zone. Take out any and all trash (there are no trash cans). Do not veer off the trail, and trample plant-life. Leave no trace!